School is out for summer, and for the Tackleford mystery team, that means lazy days, balmy evenings, and... creeping existential dread that threatens the whole city. With half the team gallivanting off to exotic locales (like Aunty Kath's in Margate), can Linton, Jack, and Lottie solve this season's most dire case? 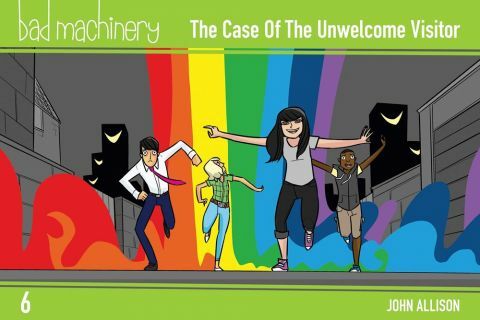 The Case of the Unwelcome Visitor, the sixth book in John Allison's award-winning Bad Machinery series, pits our young heroes against the terrors of the unfamiliar and unknown. Lottie's mum and sister have both fallen in love (thanks to the internet), Linton is determined to save his father from the soul-sucking responsibility of a promotion, and why is Jack working at the local paper with team nemesis (and hot-shot reporter) Erin Winters? Isn't print meant to be dead? Could the link between these tangled threads be The Night Creeper, who prowls Tackleford's streets and leaves people in the hospital with a blank stare and a terrible smile on their face? Other products for "Bad Machinery" in "Books"